This was my look for Easter. I was inspired by the vibrant colors of jelly beans! 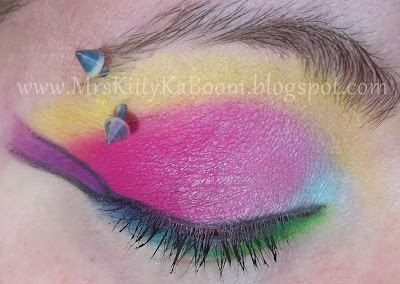 :D I don't honestly think this look is wearable, but it was so much fun! Thanks for looking! All colors used were from the CS 88 original palette. Over NYX jumbo pencil in Milk. I also ran over to Walgreens to take advantage of Wet N Wilds 69 cent sale. All their products that are regularly 99 cents are currently on sale till late May. Im not exactly sure of the date it ends. However the Walgreens closest to my home was picked pretty bare. I only got 3 things, two of which I wore with this look. I got the black eyeliner pencil and this lippie. 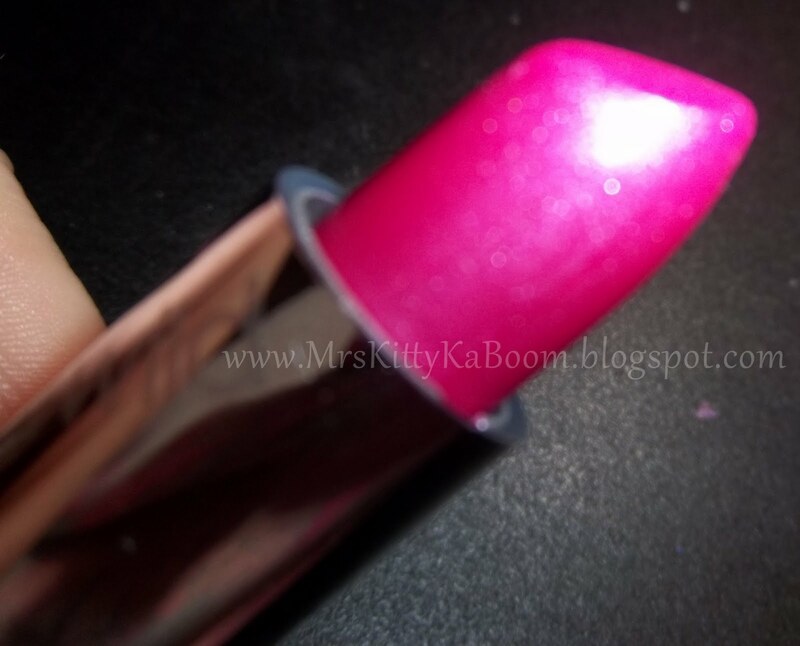 This is 505A Light Berry Frost Lip Stick. Its a nice bright fuchsia with a blue sparkle! Very pretty. Im happy with the feel of it on my lips. Its very creamy, however I can't vouch for the longevity of the wear as I didn't wear it very long. I hope you all had a great weekend! I've been playing a TON of Rift lately, and before that I had houseguests for about 2 weeks. Hopefully, I will get back into the swing of things. I have a lot of posts planned. I am also gearing up for a giveaway at 100 followers, or around there. Picking out lots of cute things for you guys! Talk to you all soon! Love how vibrant your jelly bean look is, so pretty! WOO HOO! 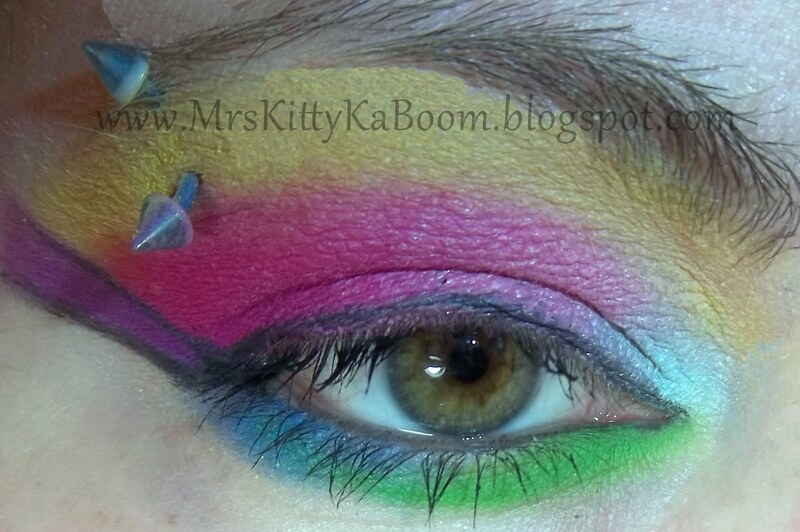 Love the bright colours, it looks cool with your eyebrow ring! I also enjoy the cutout lip swatch! Great look! The hot pink e/s is tdf! The lip swatch is so cool, very Rocky Horror! hey hun! i think your easter look is stunning--great eye makeup. Please enter my Jennifer Elizabeth fringe shimmy necklace giveaway -- worth more than $200! The giveaway is open internationally and ends May 14! I would totally wear this look any day, but then again I am weird. LOL Love it! :) hehe. thanks Chantel. LoL. Glad to meet another color addict like myself.